Opening in 1979, with original owner Fred Gay, the Connecticut Yankee started as the "Repairer and Purveyor of Bikes and the Like". Many people ask where the name "Connecticut Yankee Pedaller came from. Give credit or blame, whichever you prefer, to Fred. There is a part in the book A Connecticut Yankee in King Arthur's Court (by Mark Twain-- also a movie starring Bing Crosby) where a Yankee from the state of Connecticut is translated back in time to England at the time of King Arthur and the Knights of the Round Table. This Yankee began producing bicycles and even successfully convinced the Knights to use the bicycles instead of horses! Fred thought this was a quaint aspect of the book, and thus the name of the business. In late 1980, for a period of 1 year, a partnership was formed, with Fred, Dave Hendricks, Glenn Williamson, and Mike Streit all sharing in the workings of the business. In October of 1981, Dave Hendricks became sole proprietor of The Connecticut Yankee Pedaller, and the ownership has remained to date. The Shop has been in 4 different locations, all in Lucas County, Iowa. The first, under Fred and the Partnership, was located at 209 1/2 N. Main with a back alley entrance. The second (for 10 years) was in the Hendricks' garage located at 613 Woodlawn, Chariton. After a move of the Hendricks family to the country, the third location was at Route 1, Box 61, Chariton, and allowed an increase in shop size from 480 square feet to 1200. The location at 908 Court on the Chariton square came about in November, 1998. 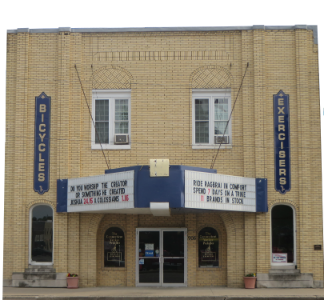 In April, 2004, another 3000 square foot section was added as there was an expansion into the vacant Ritz Movie Theater at 906 Court, one door down. This allowed for display of a much larger amount of exercise equipment along with more bicycles. The Winter of 2007-2008 saw major remodeling of the Ritz Theater into showroom space, and we moved out of the smaller drugstore that we started in at the 908 location. The bicycle maintenance and assembly area has been increased in size to accommodate both a greater number of bikes to be serviced as well as the increasing number of tricycles we sell and service. We now have about 4300 square feet of showroom space for bicycles, fitness equipment, clothing, accessories, parts, and service area. With the tall ceilings of the Ritz Theater, there is a lower showroom and service area as well as an upper showroom that is ramped to accommodate all ! !